My sister gave me this gorgeous Grevillea for my garden. Called Dorothy Gordon, it’s colour is listed a purple, but, as you can see, it does contain a lot of pink. Grevillea ‘Dorothy Gordon’ originated in Myall Park Botanic Garden, just like her famous daughter namesakes Grevillea ‘Robyn Gordon’, Grevillea ‘Sandra Gordon’ and Grevillea ‘Merinda Gordon’. This beautiful new hybrid is the Directors’ selection with parentage from Western Australian and Queensland. 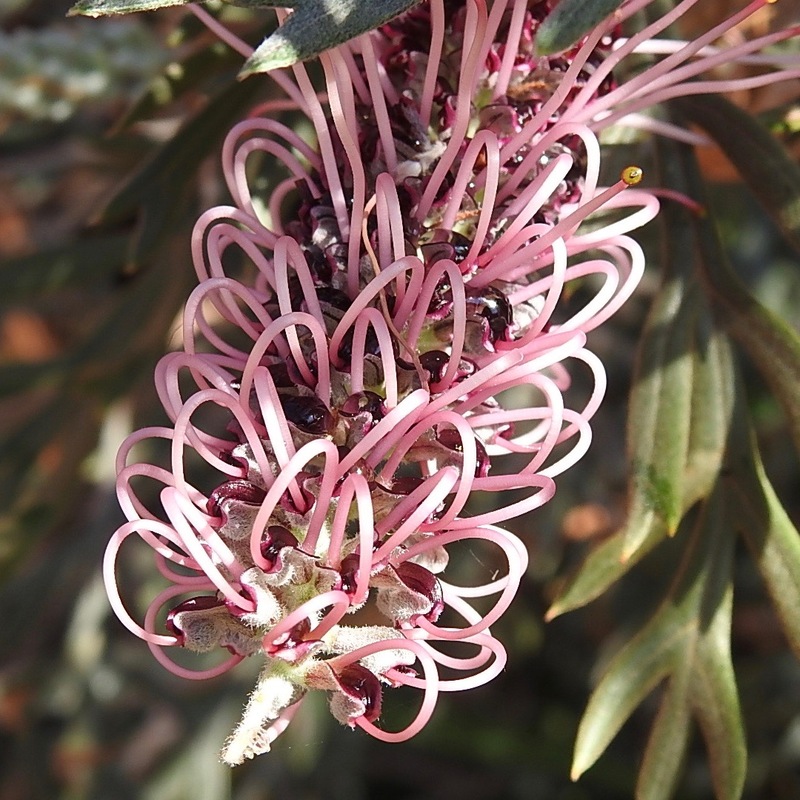 Both parents are widely separated botanically and regionally, and thus Grevillea ‘Dorothy Gordon’ has no fertile seeds. Grevilleas are Australian through and through, as Aussie as Vegemite and Tim Tams, and they grow in many forms all over our amazing country. From ground covers and compact shrubs to Grevillea robusta, a tree that towers up to 40 metres tall (100 feet) and is more commonly known as Silky Oak. There are Grevilleas for every use and they belong to the Proteaceae family, a flowering plant family predominant in the southern hemisphere. There are approx 360 species of Grevillea, and I have five of them, each one planted for their bird attracting nectar. Our yard is always full of birds and bees when the grevilleas are in full bloom. One variety I have just so happens to be a beautiful bright pink variety. Stay tuned, I’ll share a photo of Lollipop tomorrow. Such an amazing flower, and this is a lovely shade too. I think it might be a trick with the light because it’s colour is usually much deeper. Then again, I am still learning to use my new camera, so perhaps next time the colour might be truer.